But as we think about radio’s future, the first step is to define what radio actually is today.We can quickly agree that the FM/AM bands qualify. This Arbitron study had reference to HD Radio but I’m going to exclude that, partly because I don’t know much about it and partly because increasing the sonic fidelity of an endangered species sounds like one of the most deeply daft strategies I can imagine. This brings us to satellite radio, your friendly Sirius XM musical monopoly. As I know they’ve been battered and bruised for years, I dipped into the interwebs expecting them to be teetering once again on the brink of bankruptcy. But, wouldn’t you know it, they’ve just upped their guidance and appear to be on solid footing and here to stay. As best I can figure, satellite radio sources the success it has by being an automotive hybrid of your laptop and your dvr: on one hand, it presents tiny slivers of musical genres that provide pre-made laptop-esque playlists for those who lack the inclination or the musical library to make them. On the other hand, it provides dvr-esque access to big time media properties. Or, from what I can gather, one property in particular: Howard Stern (?). Oh, and from what I can gather people are at best a secondary audience: they’re making their money luring people in through new car sales: a musical version of the *free* magazine subscriptions so generously offered in the Best Buy checkout line. I struggle to understand Sirus XM’s success because it is so antithetical to how I think about radio. For me, it’s a half-assed playlist standing in for what has always been a medium of discovery. Satellite radio manages to raise my expectations: with stations nearly as specific as “listenable hip-hop for white males aged 34-36,” I drop the serendipity tolerance that I typically have for old school radio but then am routinely disappointed. It’s neither an adventure nor a greatest hits mix. Yuck. After many threats from many different sources, Pandora has made it through the legal gauntlet and seems to be the smartest, most radio-like source of radio out there. For various reasons over the past week (not only forgetfulness, you should know), I left my iPod at home and thus had to turn for Pandora for my musical fix. And in so doing, I discovered many things. First of all, it’s got far more ads than I remember: it’s Hulu with a more immediate profit motive. Second, they’re building in some social dimension via Facebook that’s really quite interesting. But perhaps most curious of all was the promise of its iPad app: check it out (scroll down a bit on the link in the prior sentence) and the tantalizing glimpses appear to offer the most compelling experience I’ve seen in a while for a new kind of musical discovery experience. In a musical world that is digitally atomized into individual mp3 tracks, the depth to which people are able to experience music has plummeted. People typically know nothing about the single or the band or the album they just got from a friend or a random blog. Simultaneously, these mp3s get channeled into highly-efficient playlists that lead to a fairly profound musical tunnel vision: with the ability to re-arrange what you already know, you’re desire to roam drops. In an age of digital efficiency, serendipity vanishes. But here, with Pandora, you’ve got an experience of curated discovery that presents to you in the moment the story of the artist and the album. Very, very cool. 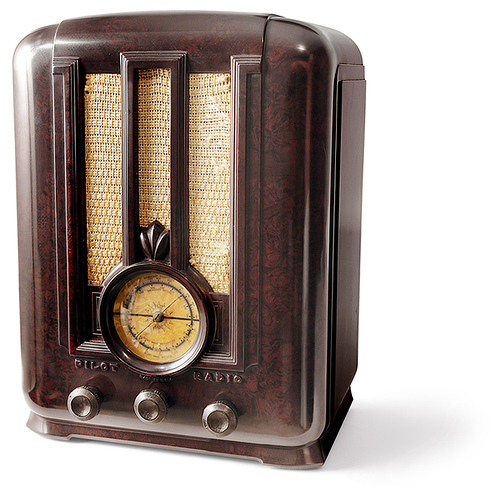 I’m running out of writing time here, but I’d like to ask one more question: don’t you think Apple is going to present their version of radio soon? I don’t mean the random quote unquote radio silliness that they currently have in your iTunes scroll. I mean a real re-invention of radio: a *genius* level musical exploration, informed by your musical preferences but roaming off into areas that you wouldn’t have heard otherwise but could purchase in the moment. It’s a lay-up. And if you’re asking, I’d help out with the design. This is a music entry, after all. So I suppose I should offer a song frequented on radio stations both terrestrial and satellite, but with a twist that you knew I would put on it. Rude Boy, with a Wale freestyle. This entry was posted in Music + Moments and tagged 30 days of music, Apple, Facebook, Howard Stern, iTunes, marketing, Pandora, radio, Sirius XM. Bookmark the permalink.